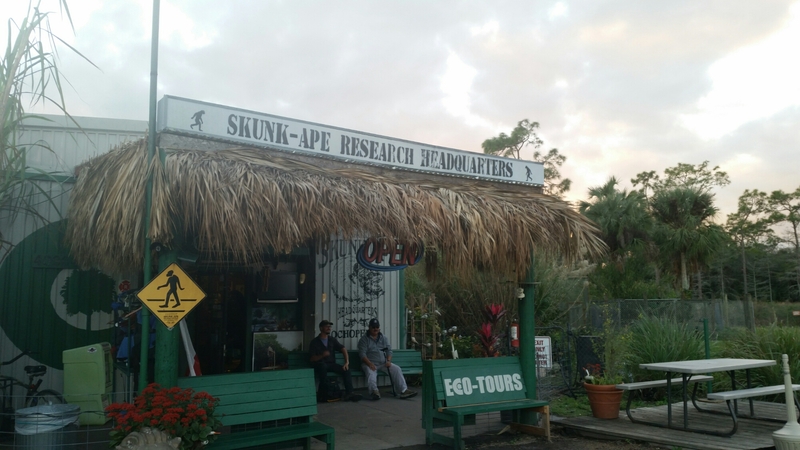 We stayed at the Skunk Ape Research Center, the campground for the Tuesday night, and in the morning the amazing Florida Trail Alliance crew made us a delicious breakfast of bacon, eggs, pancakes, sausages, muffins etc… It was heavenly and surely the last hearty breakfast in a while. 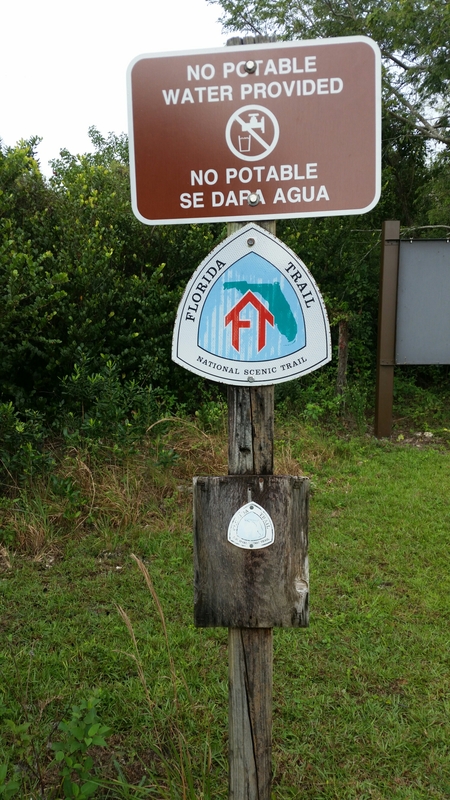 By 9:00am we were on the road to the Southern Terminus at Big Cypress Oasis National Preserve. Took a few photos with the terminus and registered for a free Backcountry permit so we can cross the swamp. 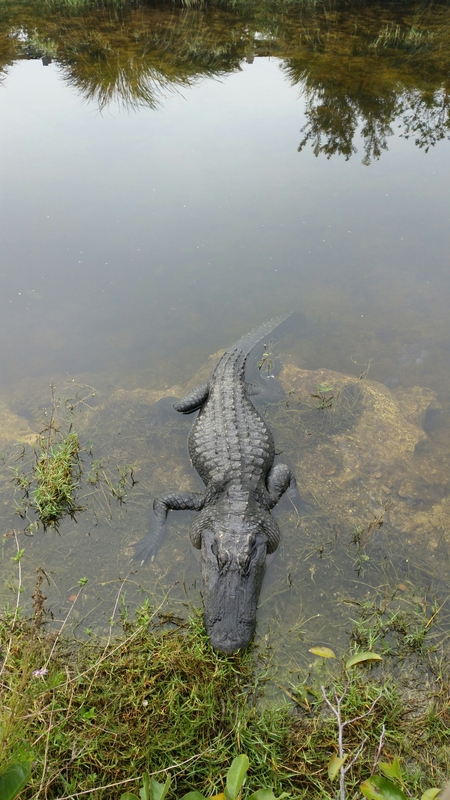 A few alligators were sunbathing at the entrance. 9:30am departure time! We started hiking and it was beautiful and sunny. It must had been around 70 degree. Perfect for hiking. Within the first mile we crossed some water, it felt nice as it was cool and in a way cooled us off a bit. Quickly I passed the few hikers I had started with, and here I was hiking alone in the swamp. Just before 7 mile camp, I had caught up to a thru-hiker named FrontPage and we talked for a bit but difficult to hear anything because we were hiking thru water and it was loud. I stopped for lunch at 7 mile camp but noon. I whipped out my umbrella, yes I carry an ultralight umbrella to keep the sun of me. I had already gotten sunburn on my arms and legs, now at least I kept the sun off my head. By 1:30pm I made it to my original plan to camp at 10 mile camp, but it was too early to stop hiking and too beautiful of a day to not continue. So I went on, a few hours later, I caught back up with FrontPage and he prefer a slower pace so I pass him. By 4pm, I passed 2 hikers that were setting up camp who had started their hike yesterday. This was their second night on the trail. They told me another guy was ahead and thanked them and continued on. I filtered some crystal clear swamp water and arrived at 13 mile camp later on around 5pm. Another hiker was here, Syd the sloth, we cooked dinner and chatted. He has done the AT and the Benton McKaye trail. (sorry for the spelling, if it’s wrong) he has been thinking about potentially yo-yoing the trail and he will do the ocean-to-trail section. Good for him. He started in the morning, but earlier than we did. It was dark by 630pm. I jumped in my tent, home sweet home, and went to bed. Rain had woken me up at 4am so here I am writing this entry. There should be some trail magic at I-75 on Saturday but I believe that with my current pace, I may pass it. We’ll see what day 2 of hiking is like. 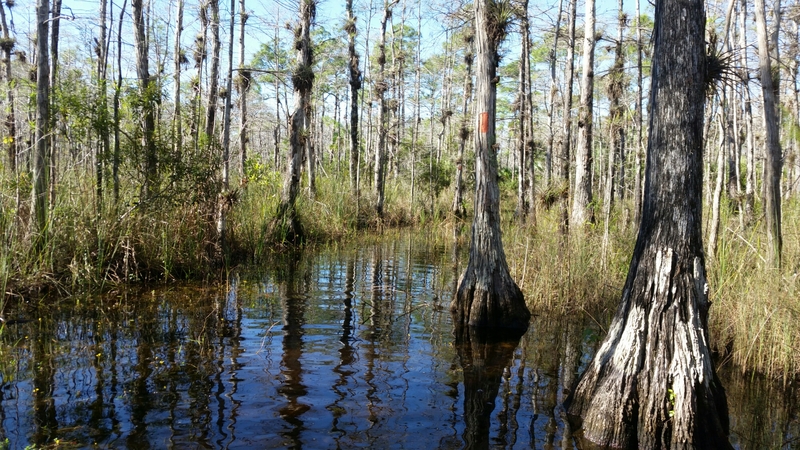 As far as the swamps… It’s beautiful! Wet but beautiful. The water is crystal clear until you hike through it. Today’s hike was about 75% wet. I had some pretty crinkly toes by the end of the day but thankfully no blisters or hot spot. I do have sunburn. This Canadian skin ain’t used to the exposure to the sun. Yikes! Back to the swamp hiking, the bottom is pretty slippery. I was told it was old corral. And you can see it sometime peek out of the water. It is now smooth and slippery… Did I say slippery? Yeah, I slipped and fell in the swamp. No worries, no one saw me so nobody will know. Water level has been mostly ankle and calf deep, with some areas that were knee deep. I hear tomorrow will be slightly deeper which means slower hiking. Mosquitoes aren’t so bad either in the swamp. They were bad at the campsites but tonight, only a few bothered me. I saw lots of shiny eyes on the ground… You know what that means. SPIDERS! Eeeekkk. They may have been little wolf spiders. At least one was. Anyway, that’s the report for today (yesterday). Hope to continue hiking strong today. Happy trails! Nice first day in the swamp! You’re not giving yourself enough mileage credit – 13-mile camp is 18 miles (OK, 17.8 miles) from the start point! I’ll put this in your comment section for your readers. (I know that you already know this stuff): These camp names are all very weird. 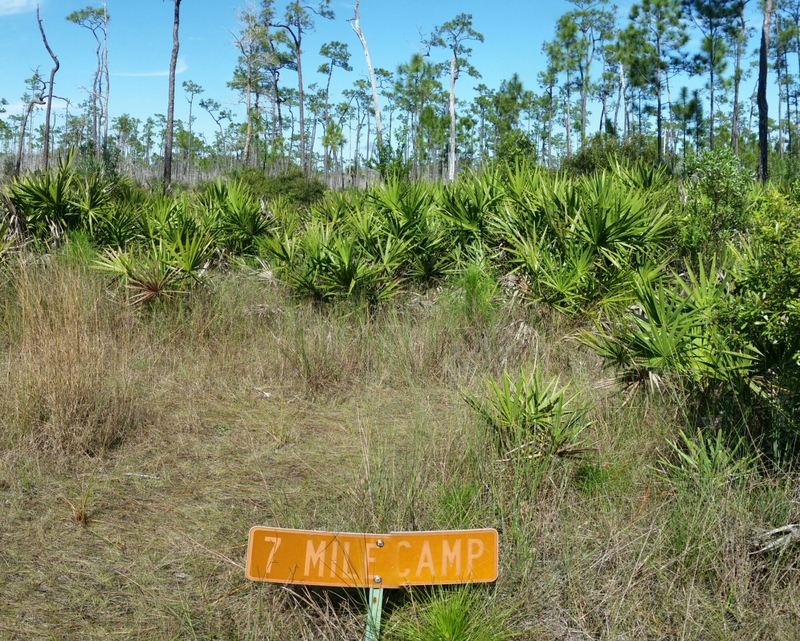 Seven Mile Camp is seven miles from the start point. 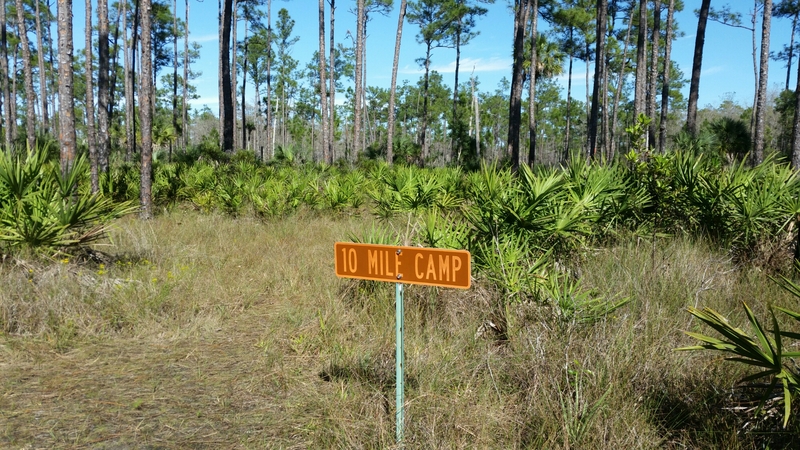 Ten Mile Camp is ten miles from the start point. So far, so good, right? 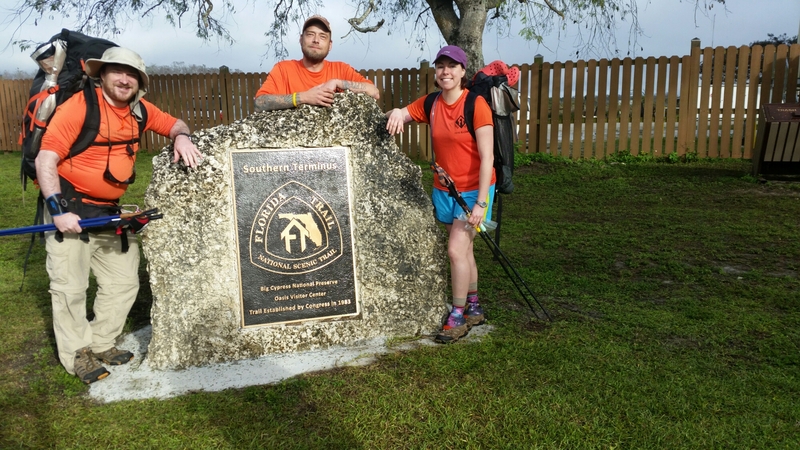 But Thirteen Mile Camp is eighteen miles from the start point! For some strange reason, it’s called Thirteen-Mile Camp because thirteen miles are measured from the OTHER direction, from I-75. It’s actually farther than I thought! Thanks for the heads up. Loving everyone moment of it.